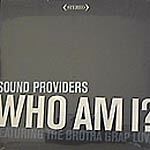 Soundproviders are fresh and jazzy-clean sounding and this record is no exception! From San Diego, these guys are heating up fast with the jams that take you back to Summertime 'back in the day'. Produced by Sound Providers. Lyrics by Sound Providers. Scratches by Soulo.